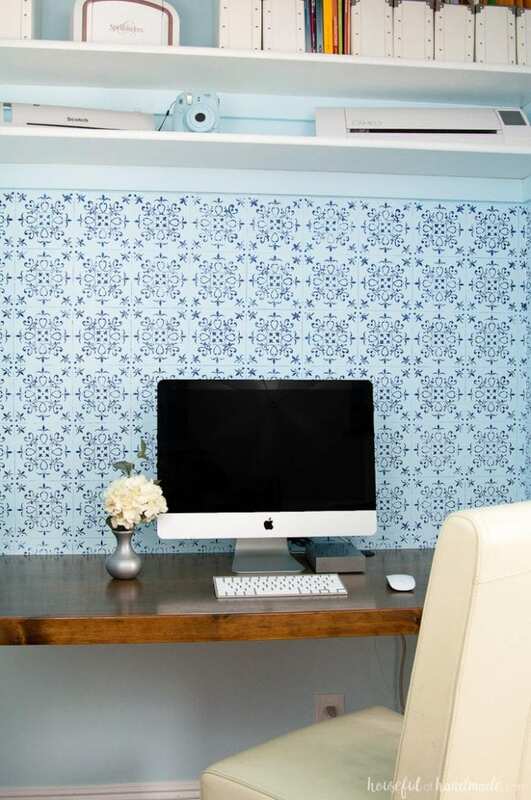 One of the most important parts of my office & craft room makeover was a desk. It is first an office, and I need a place for my computer. When I first took over our old nursery, I knew immediately I wanted to add my desk to one of the two 5′ closets. It was a great way to add a desk without taking up much needed crafting space. Also figuring out how to build a desk in a closet was the perfect budget friendly solution since I am redoing this entire space for only $100! Yep, you read that right! I am redoing my entire office & craft room for only $100 as part of the the $100 Room Challenge. It may seem impossible to makeover an entire room for only $100, but it it totally doable with just a little creativity. 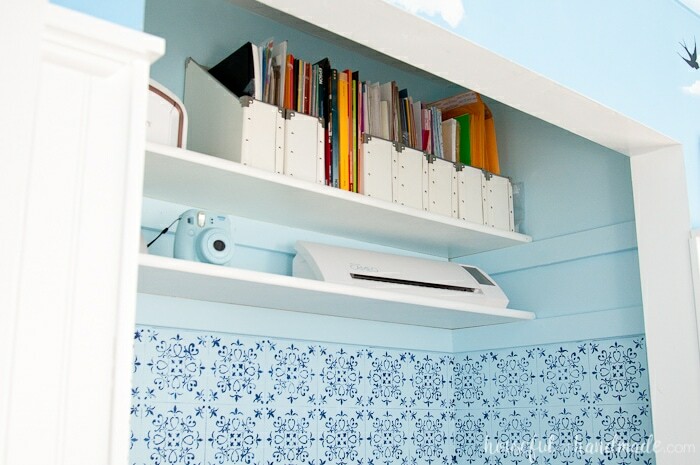 Which is why this desk in a closet was the perfect solution. I knew I could build a desk, but the cost of wood can easily come to $100 alone. That leaves me with nothing for the rest of the room. But in a closet, I only need to build the top, no legs are needed, so the cost of wood is much less. I built this entire thing (and painted the space) for only $40. One of the things I was worried I would miss what the drawers on the side of my desk. You know, someplace to keep pencils and such. But I don’t miss it at all. I am making a cute little desk organizer to hold the things I need immediate access to, and the rest are stored with all the other craft stuff in my room. And I can tuck a little trash can under my desk now, where before there was no room for one. I also love that I have walls on either side of my desk. I was afraid I would be claustrophobic at first, but instead I love those little walls. 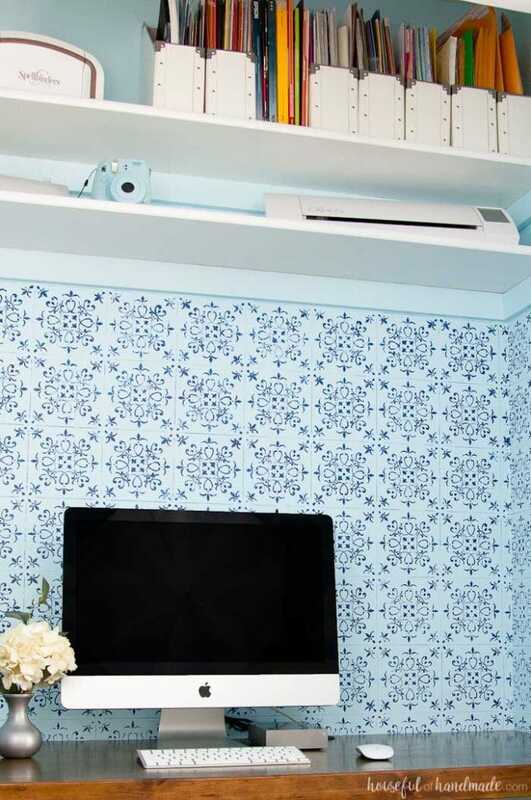 My plans for the room include a paper organizer one of these walls. I also plan on doing some cute mirrors or other decorative pieces for my new favorite space. Since this was a clothing closet, there were already a couple shelves. I just moved them up and out of the way. I also moved them closer together and now they are the perfect place to store my paper crafting supplies. Plus, I am planning on hanging a couple sconces from the shelves to add a little more light to my desk area, which will come in handy when I am working late at night. After I got the desk built, I needed to decide on how to paint the area. I had a bit of paint left over from our dining room and since I absolutely love the color, it was the perfect solution for my budget remodel. But I needed something more. After tossing around a lot of ideas with my husband (thanks to a 6 hour flight layover on our trip to Hawaii), and looking at lots of beautiful inspiration rooms online, I decided I needed to add some pattern to my desk area. 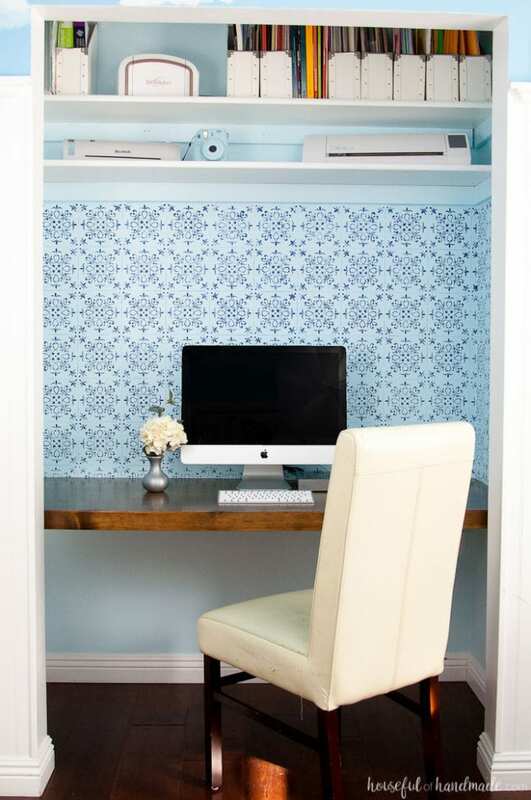 A patterned wall can be a little intense, but in a closet desk area, it adds the right amount of chic without taking over the whole room. 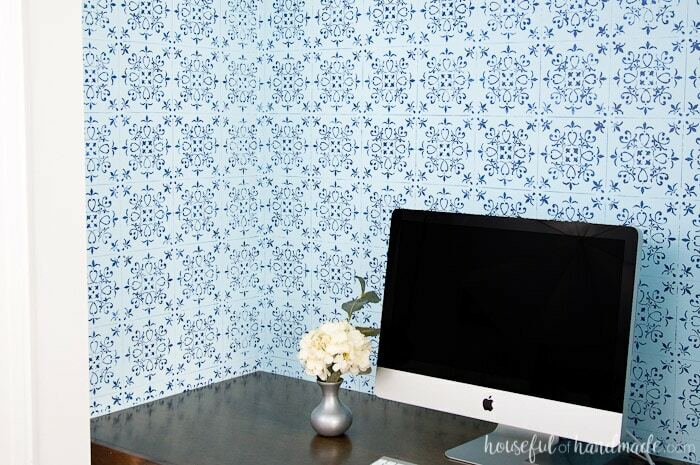 I created a stencil that looks like the patterned tiles that are popping up all over home designs these days. This is the best way to get the high-end look of hand-painted patterned tiles for just a few dollars and a few hours of work. I couldn’t be happier with how it turned out! 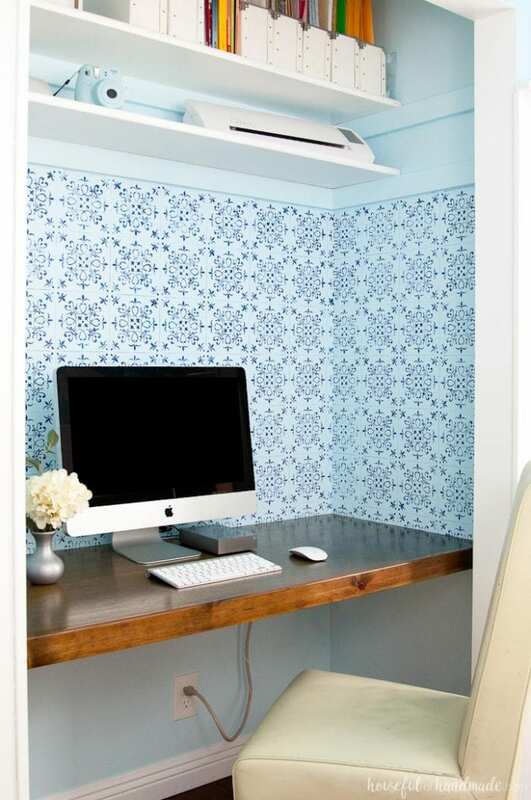 If you want to see how to build a desk in a closet for just $40, click the arrow below for the tutorial. And to see how I am doing with my $100 Room Challenge this month, check out the week 2 update and then follow along to see all the creative (and budget friendly) projects. where can i find the thick plywood? i just find really thin ones at home depot and lower. where did you get yours? The plywood I used is 1/2″ from Home Depot and then I covered the front with a 1×3 board to make it look extra thick. It’s way less heavy than a thick desk top and much cheaper! I love how this little space is coming together! The stencil you made really does look like tile.